The federal Workforce Innovation and Opportunity Act (WIOA), which goes into effect on July 1, 2015, provides new opportunities for the public workforce and adult education systems to work together. In particular, the law requires that each state develop a unified plan that describes strategic and operational elements across WIOA’s four titles. Thus, WIOA’s workforce (Title I) and adult education (Title II) activities will need to be more closely coordinated. This brief outlines some key areas where alignment can occur. Want to learn more about the Workforce Innovation and Opportunities Act (WIOA)? Click here to get the facts. 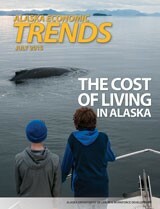 July Trends is Alaska Department of Labor & Workforce Development’s annual cost-of-living issue, which compares costs across Alaska along with other U.S. cities. We also look at the rise in costs over time, as determined by Anchorage’s inflation rate. The overall rise in prices was relatively small in 2014, and transportation costs went down slightly.